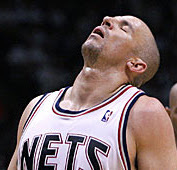 when jason kidd joined the new jersey nets in the 2001-02 nba season, he immediately made it known that the nets will be a serious threat. he went on to lead the team to the championship that season but was swept by the lakers. next season saw them returning to the peak of the eastern conference only to be defeated again in the championship by tim duncan's spurs. in december of 2004, the team was joined by half-man half-amazing, vince carter from the toronto raptors. the two became the one-two punch of the nets and went on to grab the last spot in the eastern conference by edging out the cavs, much to the dismay of lebron james. but they got swept again by a team powered by diesel. by that i mean shaq. anyway, am getting carried away again, earlier this year, and late last year, there have been talks about kidd wanting out. since richard jefferson (thomas jeffereson according to ali g.) and vince carter were given high-priced contracts, it seemed that kidd is no longer the priority of the team. so kidd wants to be traded before the trading deadline which is on feb. 21. so watch out for that. the nuggets and the mavs are reported to be interested in acquiring the service of the veteran point guard and this year's starter for the east all-stars.